This book is an addition to the number of books written by Prof. Kuppusamy on radiological physics, diagnostic radiology, radiation safety, and medical physics. Medical physics being a multidisciplinary subject demands adequate knowledge of basic biology, radiation physics, cellular radiobiology, tumor biology, and biological effects of ionizing radiations. The author having gone through this rigorous training at erstwhile Directorate of Radiation Protection, Bhabha Atomic Research Centre, has effectively used his knowledge while creating this handbook. The information contained in this handbook can be obtained only by referring to a number of books, and these books are not easily accessible and also very expensive. Prof. Kuppusamy has tried to overcome this problem by writing this handbook. The first chapter of the book deals with basic biology. Even though the chapter covers many aspects of biology, there is an ample scope to make this more informative by providing some more information on tumor biology and also by including a few illustrations to describe the human anatomy. There are also a few minor errors which, though not serious, could have been avoided. The second chapter deals with basic radiation physics. This chapter provides information on the atomic structure, nature of radiations, interaction of radiation with matter, energy dissipation, attenuation of photons as well as particulate radiations, thus providing information relevant for understanding the basic principle of applications in diagnostic radiology and radiation therapy. In this chapter, inclusion of some information on radioactivity and some of the important isotopes used in therapy and diagnosis would have been useful. Chapters 3–5 dealing with cellular radiobiology provide extensive information on the mechanism of induction of damage, theory, and models of cell survival, physical, biological, and chemical factors modifying the radiation response. Even though the linear-quadratic model (LQ model) of cell survival is dealt in detail in a later chapter, it should have been introduced briefly in this chapter. The information contained in this chapter is important for understanding the radiation response of both the normal tissues and tumors. Chapters 6 and 7 provide information on the biological effects of radiation in multicellular organisms, specifically in human beings. The mechanistic basis for the induction of deterministic and stochastic effects, kinetics of expression of early and late damage, normal tissue toxicity, human data from epidemiological studies on the induction of cancers, and risk estimation by ICRP have been discussed in this chapter. The information provided here will be useful for radiation therapy students, radiologists, medical physicists as well as those engaged in radiation protection. Chapters 8 and 9 deal with the biological bases of fractionated radiotherapy and brachytherapy. Chapter 8 focuses mainly on the radiobiological rationale of dose fractionation such as sublethal damage recovery, reoxygenation, and problems of repopulation in tumors with short potentially doubling time. Modified fractionation schemes and their applications in specific situations have also been discussed. Chapter 9 describes the radiobiology of brachytherapy. The effect of dose rate and the role of 4Rs of radiotherapy, comparison of low-dose rate (LDR) and high-dose rate (HDR) protocol, rationale for choosing the fraction size for HDR, influence of geometric sparing, etc., have been discussed at length. It would have been good to include some information on the new radionuclides such as ytterbium-169, thulium-170, Cs-131, and Ru-106. Chapter 10 of the book describes the time, dose, and fractionation models. The author has rightly reviewed the contributions of Strandquist, Ellis, and Orton in the development of cube root rule, nominal standard dose, time-dose factor, and cumulative radiation effect. Since these models have limited use and do not have sound biological mechanistic bases, they are fraught with uncertainties in predicting the physiological response. The author has pointed out these while explaining the limitations of these models. Most part of this chapter deals with more reliable biologically effective doses (BED) based on the LQ model of cell survival. To make it easier to understand Prof. Kuppusamy has provided many worked examples. These examples should enable the reader to easily understand the method of applying the model in practical situations. Many aspects such as gap correction, modified protocols such as accelerated fractionation, multiple fractions daily (MFD), rationale for switching over from LDR to HDR protocols for brachytherapy, loss of BED by prolongation of treatment, and problem of incomplete repair in multiple daily fraction schedules have been explained with examples. It would have been good if the author had pointed out that gap correction calculations have inherent uncertainties and that it would be always good to complete the treatment within the planned overall time by introducing MFD as far as possible. Even though medical physicists find the BED equations very easy to understand, the radiotherapists are not comfortable with equations and prefer the BED values presented in ready to use tabular form. Since the information provided in this chapter is very useful for radiation oncologists, it would be worthwhile making some extra effort to generate these tables. The information provided here may be useful for designing different treatment schedules and to validate and refine the models based on clinical outcome. The concluding chapter deals with basics of radiation safety. Various derived units in radiation protection have been defined and explained. Besides dealing with the physical concepts of radiation protection, dose limits and personnel monitoring have been covered. Since the medical physicists are very conversant with radiation safety and radiation protection, the author has curtailed many relevant details. If only the author had covered some of the information dealing with the bases of justification, optimization, and dose limitation and also some of the information from ICRP 103 (2007) general recommendations dedicated to safety in medical application, this handbook could have been relevant to wider audience. Even though the handbook has been primarily targeted for medical physics students, it will useful for biophysics students with special papers in radiation biophysics and medical biophysics, radiation oncologists and radiation therapy students, and also those engaged in radiation protection. 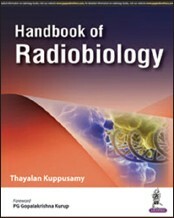 Being a handbook and constraint on the number of pages, the author has not provided some of the interesting details regarding the modern concept of mechanism of induction of radiation damage at molecular level, early and late normal tissue toxicity, tumor kinetic parameters, radiobiological aspects of new modalities of treatment, and radiobiological bases of radiation protection. If only the author can elaborate in these areas, this handbook can be a good textbook. During this transformation, the author needs to pay some attention to improve the presentation of figures in the biological section and also to refine the information dealing with radiation chemistry. Good-quality scientific information provided in this handbook reflects the dedicated efforts of the author and also his scholarship and professional experience of many decades. He deserves appreciation for his efforts to bring out this handbook at a very reasonable cost for the benefit of the student community.